A summer evening in Republic Square in Yerevan, Armenia. Part of the ancient Noravank complex, near Yeghegnadzor, Armenia. One of the many amazing desserts at Sherep, a popular restaurant in Yerevan, Armenia. A woman hangs textiles for sale at the Vernissage market in Yerevan, Armenia. The Cafesjian Center for the Arts in Yerevan, Armenia. A Greco-Roman temple in the village of Garni, Armenia. It is believed to have been built by King Tiridates I to the sun god Mihr. A priest burns incense at the Noravank Monastery, near Yeghegnadzor, Armenia. A woman takes a photo at the ancient Noravank complex, near Yeghegnadzor, Armenia. A summer evening in Republic Square in Yerevan, Armenia, on Aug. 10. Each time I’ve come to Yerevan in the past decade, the city has surprised me with its evolving elegance and cultural richness. The downtown has an energy that is a long way from the sleepy Soviet city I first visited in the 1980s. Walking the shady avenues off Republic Square on a recent visit, I found the city has become a hip place, with wine bars, microbreweries, cafes, art galleries, boutiques selling crafts and carpets, and an ever-new array of restaurants, as well as upscale hotels and clothing stores. The new mood is defined by the millennial generation’s role in the velvet revolution of this past spring. After weeks of peaceful protests, the civil society has pushed from power an old regime that much of the nation viewed as dysfunctional and corrupt, representing a continuation of old Soviet mentalities. When Nikol Pashinyan, a prominent journalist, activist and former parliamentarian became prime minister May 8, a sense of a new era enveloped the country. In June, I sat in a vine-trellised courtyard restaurant and art gallery on Abovian Street with Armen Ohanyan, a young fiction writer, and Arevik Ashakharoyan, a literary agent. I was hearing Armenia’s new voices of optimism. “Soviet minds are a thing of the past,” Ohanyan said. Having written about Armenia for decades, their words resonated. I am a poet and nonfiction writer of Armenian ancestry and have been to Armenia five times in the past decade. My trips are often connected to my work — a translation of one of my books, a lecture tour, a symposium. I started the day grazing on a classic Armenian breakfast spread at the Armenia Marriott Hotel Yerevan, an elegant hotel on Republic Square with fine local cuisine: bastermas (spicy, cured beef); paper-thin or thicker warm lavash; local cheeses; jams with strawberries or apricots or walnuts; thick yogurt; cherries, apricots, blackberries and melons from local orchards; fruit nectars and orange, red and brown rolls of thick grape molasses stuffed with walnuts (sujuk); and black tea from a samovar. The presentation was beautiful, and the Caucasian sun poured through the windows. Like its cuisine, the country has a long, rich history. Armenia, which became an independent republic in 1991 after the fall of the Soviet Union, is a small, landlocked nation in the southwest Caucasus, at the crossroads of Europe and Asia. The country today is what remains of a once-ancient empire that stretched from the Mediterranean to the Caspian Sea in the first century B.C., before it was conquered by the Romans. It was the first nation to make Christianity its state religion, in 301. Armenia became a Soviet Republic in 1920, endured Stalin’s purges and repression, a massive earthquake in 1988 and a war with neighboring Azerbaijan in the 1990s that has flared up again in recent years over the province of Nagorno-Karabakh. By all rational odds, Armenia should not be on the map today. Having survived such a harsh history, Armenia has emerged as a democracy that cherishes the many layers of its past. Today, the capital, Yerevan — which dates to the seventh century B.C. and was founded on the walls of the Urartian city of Erebuni — is a blend of ancient culture, artisan tradition, modern architecture and high-tech, postmodern style, exemplified by the new condominiums and high-end shops on the pedestrian Northern Boulevard. On Sept. 29-30, Yerevan will celebrate its 2,800th anniversary, making it one of the oldest cities in the world. In the ruins of the ancient fortress on Erebuni Fortress Hill, fragments of murals with images of sacred animals evoke the late Bronze Age. The Erebuni museum has a fine collection of artifacts, including a huge wine storage container that documents Armenia’s winemaking tradition from the Bronze Age. Those amphoras prompted me to visit the Ararat Brandy Factory, an imperial monument to the Armenian passion for the grape, set on a perch overlooking Victory Bridge, which spans the Hrazdan River. I love walking the beautifully lit cavernous halls filled with Caucasian oak barrels. Ararat Brandy has been a major export for more than a century, and its velvety depths were made legendary by Winston Churchill, who drank it daily for decades. I left with a glow of delight after the brandy tasting that concludes the tour. Yerevan is a city where many avenues are named after Armenia’s great figures: the early 20th-century poet Yeghishe Charents, the fifth-century historian Movses Koranatsi, the 19th-century novelist Katchadour Abovian, the composer Komitas (1869-1935), to name a few. It’s a city of great museums, including the Matenadaran, which has a rich collection of medieval illuminated manuscripts and books in Armenian, the National Gallery and the History Museum of Armenia. I always head first for the intimate museums dedicated to major figures. The Saryan museum, for example, has two floors of works by the avant-garde landscape and modernist painter Martiros Saryan (1880-1972). In a stately stone house, the Sergei Parajanov Museum is a celebration of the great 20th-century filmmaker and visual artist’s work: mixed media collages, paintings, conceptual installations and miniature drawings on matchbooks and bottle caps from the time he was imprisoned by the Soviet authorities for “decadent” art and homosexuality. I always get a good workout climbing the 572 steps of the Cafesjian Center for the Arts (also known as Cascade). It’s a dramatic complex rising up from the tree-shaded, cafe-abundant Tumayan Street in five monumental limestone tiers of fountains, topiary gardens and sculptures. If you tire of the climb, you can slip inside and take the escalator, and soak up one of the most important collections of modern glass in the world, as well as paintings, drawings and sculpture. No one should come to Yerevan without visiting the extraordinary Armenian Genocide Museum and Memorial, also known as the Tsitsernakaberd (meaning swallow’s fortress) Memorial Complex. It is situated on a hill that overlooks the city and Mount Ararat, Armenia’s national symbol, just across the border in Turkey. Built of sleek gray basalt, its elegant new wing was designed by the museum’s director, Hayk Demoyan, and his wife, designer Lucine Matevosian. The wide circular exhibit halls wind from a top floor down to a second floor. Photos, maps and documentary footage on various screens accompany text that explores the history of the horrific events that took the lives of more than 1 million Armenians in 1915. From the museum visitors walk the stone walkway to the memorial — towering twin obelisks (a symbol of eternity) and 12 20-foot high stone pillars — to lean over a large circular area where an eternal flame burns and sacred music plays. Back in Yerevan for the evening, I dined with friends and found the cuisine more inventive than ever. Restaurants blend the traditions of the Armenian Caucasus with the Middle East as refugees from Syria and Iraq make their impact. At Sherep, one of the hottest new places, with a chic open kitchen and late-night jazz, I had mountain sorrel soup; tender stuffed grape leaves; eggplant sautéed in olive oil and rolled up with minced walnuts, dill, garlic and yogurt; and succulent lamb chops. At Vostan, in an old Russian-period stone building on Abovian Street, I feasted on pink, succulent, wood-grilled Lake Sevan trout. My travels frequently take me beyond Yerevan. Wherever you go in Armenia, you are journeying through an open-air museum where churches and monasteries, even a Hellenic temple, are built into the cliffs or perched at the edges of canyons or green gorges, with searing vistas framed by the ever-blue sky. Thousand-year-old lacelike carved stone crosses (khatchgars) emerge from fields of roadside poppies. Because Armenia is defined by mountains, canyons, gorges, forests, rushing streams and rivers, lakes, grassy highlands and dales, it has become a prime destination for hikers. The new Transcaucasian Trail runs from Georgia through Armenia into Azerbaijan, and offers extraordinary trails from the Dilijan National Park in the northern mountains to the caves of Goris in the south. Many trails intersect with ancient monasteries and churches. For a small country Armenia has an amazing diversity of flora and fauna; about 240 bird species breed in Armenia and nearly 400 move through the country, making Armenia a birder’s paradise. On a sunny morning, I headed east from Yerevan in a minivan with my superb guide, Katar Taslakyan, and a driver, Raphael Hovakimyan, whose musical selections — jazz and R&B — filled the van. About 40 minutes later, we stopped at Charents Arch, an impressive monument to Armenia’s great modern poet Yeghishe Charents (1897-1937). From there, we got a stunning view of the glistening, grassy highlands and snow-capped Mount Ararat. In another 15 minutes, we were at Garni, a beautifully proportioned Greco-Roman temple believed to have been built by King Tiridates I to the sun god Mihr. The vistas from Garni, which is perched at the lip of a gorge, are spectacular. We drove on until the conical dome of Geghardavank (the Monastery of the Spear) emerges from behind a stone wall. A UNESCO World Heritage site (like many monasteries in Armenia), the medieval church was built partly out of the side of a mountain. Monks’ caves adorned with stone crosses and arches dot the cliff face. I walked into a chapel and stared at the animal carvings on the wall as light fell through the round opening in the dome, a feature in Armenian medieval churches that creates a mysterious dark light and a heightened sense of the cosmic. A stream from the mountain runs through a wall, and pilgrims and tourists pass their hands through it. At Geghard, as with most Armenian medieval churches, you enter a distinctive organic architecture, in which building and carvings flow with the contours of nature. Unlike the Gothic cathedrals of Europe, these churches are smaller in scale and designed as intimate spaces. Here, you feel the stones are speaking to you, the light grazes you. The next day, we drove south from Yerevan into the fertile Ararat Valley. In June, the apricot orchards are popping with Armenia’s bright yellow national fruit and the vineyards are green. On this clear morning, Mount Ararat rose from a bank of clouds and the hot sun was mitigated by cool breezes. Farther south, in Vayots Dzor province, our van climbed the road to Noravank, a complex that includes two medieval churches, one of which was designed by the architect and artist Momik. Again, I’m blown away as monks’ caves appear in jagged red cliffs that remind me of Arizona, and the milky tan limestone of the Myrig Adzvadzeen church glistens in the sunlight against a brilliant blue sky and rising mountains. The chapel at Noravank is luminous with light pouring through the windows. Gazing out those windows to green hillsides, red cliffs, blue sky, I felt the shimmer of the sublime. Four miles from Noravank, I went from spiritual to chthonic, as I walked up the steps of a craggy cliff to the Areni cave where, in 2007, the earliest known clay amphoras (karases) — some 6,100 years old — were discovered. Armenia is considered the birthplace of winemaking. Archaeologists are still working there, and the Copper Age karases are well displayed in the cave where they were once used. Winemaking runs deep in the Armenian vein, and the famous Areni grape with its thick skin is the source of some of the best new wines anywhere. Throughout my visit, I had various full-bodied reds that were smooth and dry, with complex flavors enhanced by Caucasian oak barrels, reminding me of some fine pinot noirs of Oregon and certain red Burgundies. Among the better-known labels are Areni, Kadar, Kara, Trinity and Zorah. After a night on the Goris River at Mirhav, a beautifully appointed inn with antique Armenian artifacts and rugs, we drove to 11,000 feet through a fantasia of chirping nightingales, swooping eagles and clouds lifting off the green valley to the world’s longest nonstop, reversible tramway to reach Tatev, a ninth-century monastery. As a Baroque concerto spilled through the tramway’s speakers, our glass car floated above villages and ancient churches, by cliffs and grassy mountains and past gliding hawks toward the monastery, with its two conical domed churches perched at the cliff’s edge. Heading north past potato fields and farmlands, meadows of poppies and royal blue delphiniums, we drove up the western shore of Lake Sevan, one of the largest high-altitude lakes in Eurasia. Its turquoise water is a resort for bathers and fishermen, and an important source for fishing, irrigation and hydroelectric power. At a lakeside restaurant called Dzovadzots, I had a perfect whitefish soup. 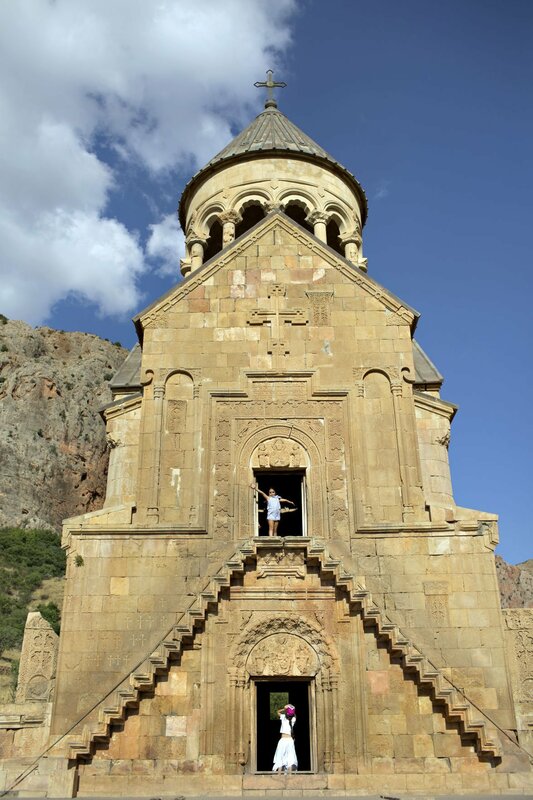 A half-hour north, the ninth-century Sevanavank monastery, with its two small beautiful, earth-colored churches on a peninsula, is worth the climb up the steps from the shore below. Just north of Lake Sevan, we crossed into the alpine mountain region of Tavush where streams and hiking trails wind through the lush forests of Dilijan National Park. The stunning monastery of Haghartsin is nestled on a forested mountain. The spa town of Dilijan, situated in the park, is an atmospheric place out of a Chekhov story. Its chalet-style buildings with gable-tiled roofs, open-air theater and mountain views made it a popular vacation spot for wealthy Russians in the 19th century; today it is a retreat for artists. One of the creative entrepreneur and philanthropist James Tufenkian’s four unique hotels is housed in a complex of restored 19th-century houses. From there, we drove to Avan Zoraget, another Tufenkian hotel, beneath the mountains on the Debed River. Sleek, imaginative and appointed with Tufenkian carpets, its rooms have lovely views. The restaurant overlooking the river offers a sumptuous repertoire: sautéed local greens and onions with yogurt; smoky eggplant dip blended with tahini; spelt with wild mushrooms; a tongue-melting sou boreg (thin flat noodles layered with Armenian cheeses), chicken cooked with dried plum and pomegranate sauce; and superb dry white wine. Back in Yerevan the next evening, I walked through an arch onto an old cobblestone street off bustling Amirian Street and found Anteb, a Syrian-Armenian restaurant, where we had spicy, crepe-thin lahmajuns (Armenian pizza); a piquant muhamara (walnut, pomegranate molasses and red pepper dip) that you scoop up with hot, puffy lavash; and kuftas, crisp shells of cracked wheat bursting with lamb and herbs. The next night my friend Ashot took me to Babylon, an Arabic-Iraqi restaurant where our feast included crispy boregs (phyllo dough wrapped around cheese), meatless stuffed grape leaves and the most tender lamb kebabs I’ve had outside my mother’s kitchen. I never leave Yerevan without meandering through the Vernissage, the open-air market in a park along Aram and Buzant streets where there are stalls and stalls of ceramics, folk and contemporary art, rugs, textiles, jewelry and more. I bought two small antique Caucasian kilims before I wandered back to Republic Square, where I end most evenings. At night the square, with its monumental rosy tufa stone buildings, is lit up; the fountains spew through colored lights, music plays, people dance. It’s a nightly ritual in Yerevan in the warm-weather months — a down-home celebration to end a day, and a resilient response to the harsh history of this new nation that has emerged from an ancient civilization.